Since it's summertime and hot here in Georgia, I’m in the mood for drinks that are on the lighter side. I recently came across a new flavored sparkling water at my local Kroger store – Vintage Sparkling Water – that inspired a new favorite evening time cocktail, Georgia On My Mind Peach Whiskey Spritzer Cocktail. 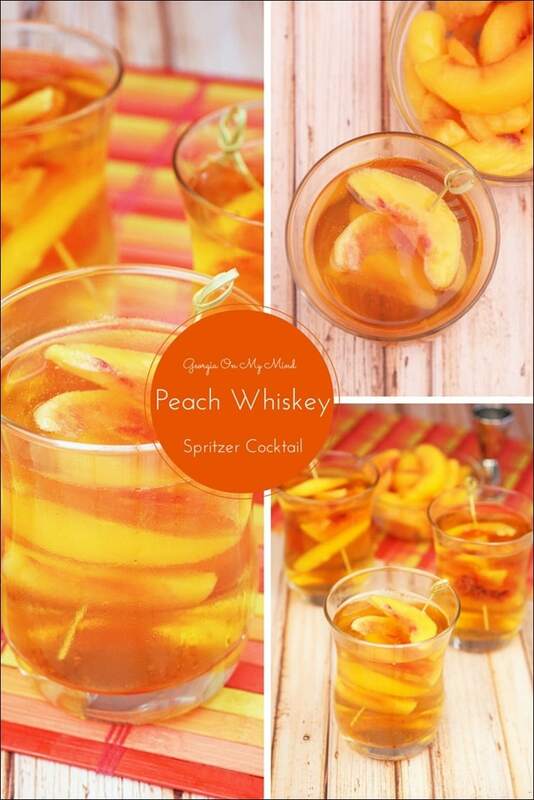 My cocktail recipe combines grapefruit sparkling water with Georgia peach flavored whiskey and peach bitters. I then use frozen peaches, instead of ice cubes, to keep the cocktail cold. (Use sliced frozen peaches from the frozen section of your grocery store. Easier than making your own.) I’ve sweetened this cocktail a bit with monk fruit to keep the calories low. If you’re making Georgia On My Mind Peach Whiskey Spritzer Cocktails for a party, run bamboo appetizer skewers through a four or five peach slices. Make up a dozen or so depending on the number of guests you’ll be serving. Then keep them in the freezer until it’s time to make your drinks. 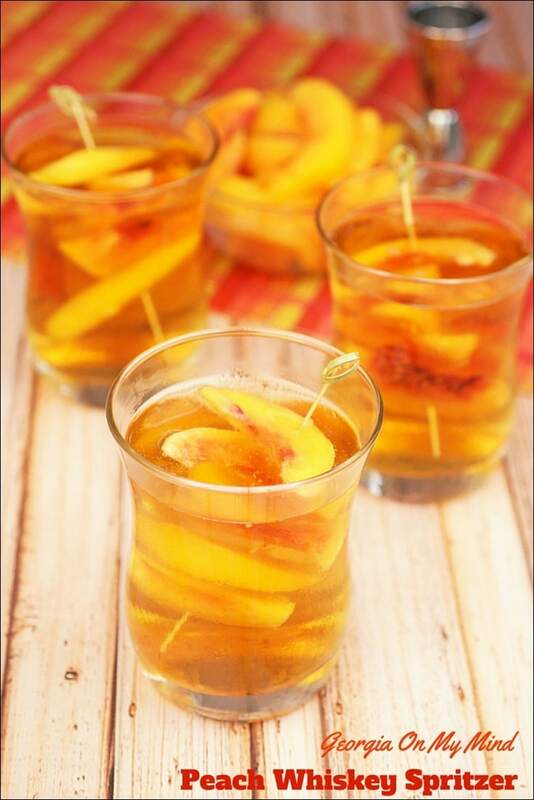 Then use the peach skewers as cocktail stirrers! What I love about Vintage Sparkling Water is that it can be enjoyed by itself since it comes in six natural flavors (Cucumber Melon, Lime, Lemon, Original, Pink Grapefruit, and Coconut). Vintage Sparkling Water has no calories, no added colors or dyes, and has very little or no sodium. You can use Vintage to “lighten up” fruit juices by using half sparkling water and half juice. You can also use Vintage Sparkling Water in sangrias to give it some fun bubbles, to make wine spritzers, or even to lighten up your favorite margaritas. Using Vintage Sparkling Water helps lower calories and gives your drinks a refreshing, sparkling feel, especially when it’s so hot outside. Or have a Vintage Sparkling Water between your favorite adult beverage, like my Georgia On My Mind Peach Whiskey Spritzer Cocktail, to stay hydrated! Now you may not have come across Vintage products before. (They also make Vintage Mixers like club soda, tonic water, and diet tonic water, and Vintage Seltzers in 10 flavors like lime and watermelon.) Well, my Kroger store only had the 12-pack of Vintage Sparkling Water and they hid the packs on the bottom shelf! However, once I discovered it, I was thrilled to see that at $3.99, Vintage was more inexpensive than other brands I’ve purchased in the past. 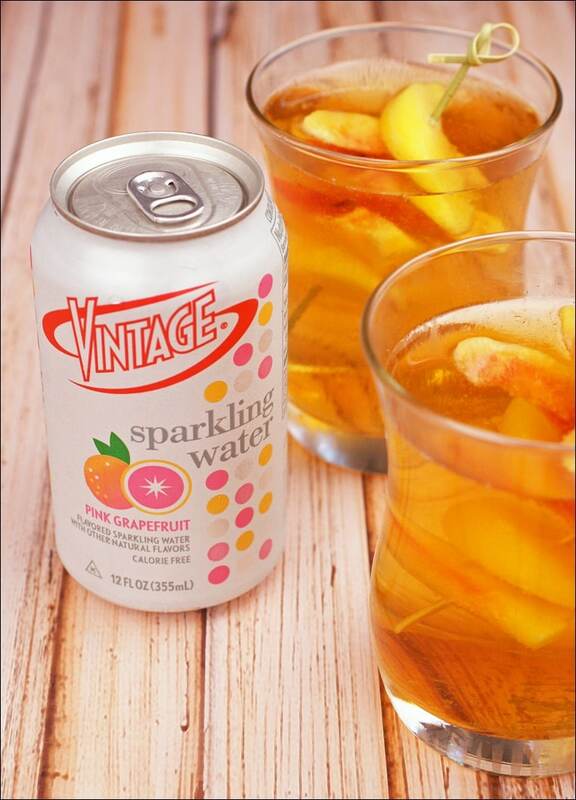 You can their store locator to find out where Vintage Sparkling Water is sold near you! If you’re interested in trying Vintage Sparking Water, click here for a digital $1 off coupon. Submit a recipe for a chance to win! Check out Vintage’s Facebook promotion and submit your drink recipe for a chance to win $500, a 1 year supply of Vintage, weekly Vintage prize packs and a chance for your recipe to be featured on drinkvintage.com! Submit your favorite mocktail or cocktail recipe using Vintage Seltzer, Vintage Sparkling Water, or Vintage Mixers each week! Share your recipe to get votes. Maybe I’ll enter my Georgia On My Mind Peach Whiskey Spritzer Cocktail! In a cocktail glass, mix peach whiskey, monk fruit and bitters with a spoon. 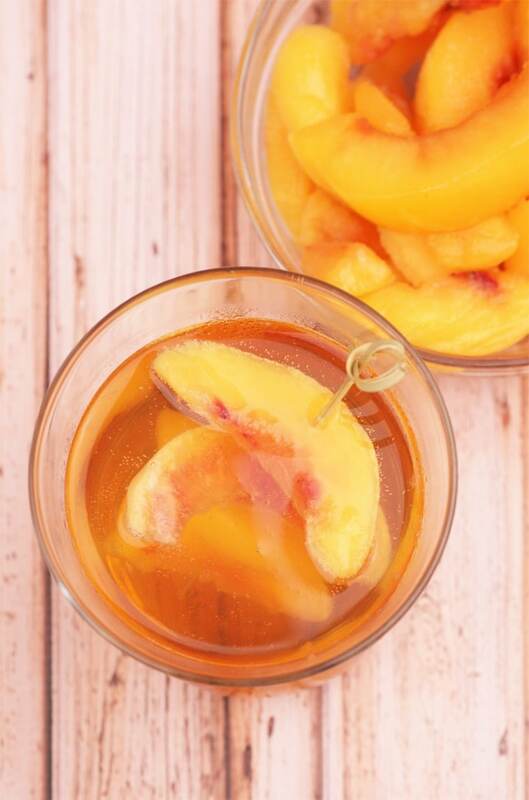 Place frozen peaches in your glass – enough to loosely fill glass. Then slowly pour sparkling water over peaches until glass is full. Stir and serve. Posted in Boozing It Up!, Recipes and tagged fruit on August 4, 2015 by Anne-Marie Nichols. Glen, leave the bitters out as I’m not sure that regular bitters would enhance the flavor. However, you could try it on a small glass and see if you like it or not with regular bitters. The nice thing about peach bitters is that is does add a nice flavor. I can’t get a hold of peach bitters in time for bbq. Can I use regular bitters instead?